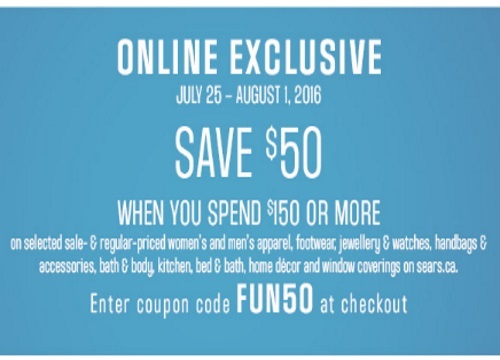 Sears is offering $50 off when you spend $150 or more on selected sale and regular priced women's and men's apparel, footwear, jewellery and watches, handbags and accessories, bath and body, kitchen, bed and bath, home decor and window coverings online! Enter the promo code FUN50 at checkout using the link below. Offer is valid until August 1, 2016. Click here to browse Sears Canada.